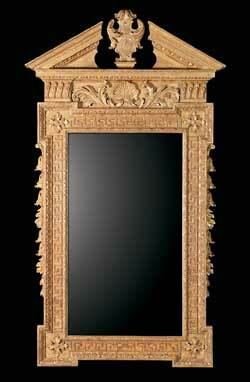 A carved and gilt-wood mirror in the manner of William Kent and the Palladian style. 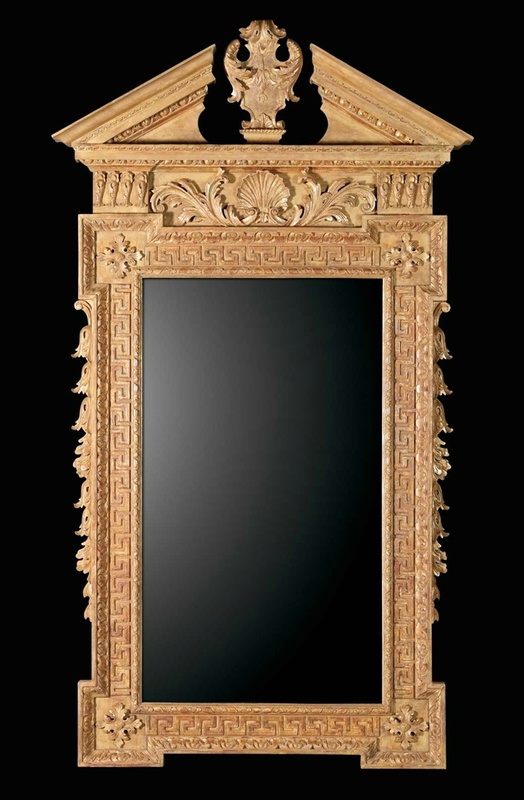 The rectangular looking glass within a compound moulded frame has outset corners, flanked by trailing bellflowers, decorated with Greek key pattern blind fretwork and with leaf carved paterae at each corner. The architectural, broken pediment is carved with egg and dart mouldings centred by an acanthus leaf wrapped cartouche. William Kent (1685-1748), architect, interior decorator and furniture designer produced sumptuous interior effects that contrasted to the severity of his Palladian exteriors. He derived much of his inspiration for architecture from Inigo Jones (1573-1652) and his interiors, from the ten years he spent in Italy. Horace Walpole (1717-1797) described Kent's work as,'audacious, splendid, sumptuous and of finished technique', and as these qualities were in demand, Kent was supremo in his generation. Height 1645mm/64.75" - Width 933mm/36.75"